Kingston Polished Brass pedestal freestanding Toilet Paper & Brush Holder CC2012: This Pedestal Toilet Paper and Brush Holder is built to last. The highest quality standards are used to precision manufacturer a top of the line product. Important features of this BRAND NEW Fixture: Complete Item! Everything necessary for installation is included. 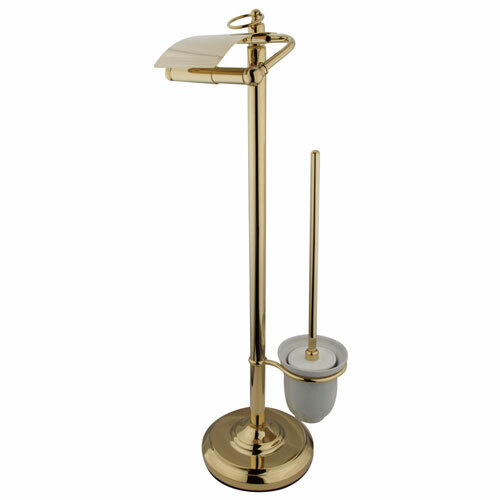 Matching Accessories Available - Easy to Install - Installation instructions included - Pedestal Toilet Paper and Brush Holder - Kingston Brass' bathroom accessories are built for long-lasting durability and reliability. They are designed so you can easily coordinate matching pieces. Each piece is part of a collection that includes everything you need to complete your bathroom decor. All mounting hardware is included and installation is easy. - 28-5/8-inch tall - 7-1/2-inch diameter base - 5-3/8-inch toilet paper rod - No tools required for assembly - Polished Brass premier finish designed to resist fading and tarnishing. This fixture is manufactured by Kingston Brass and is part of their Vintage collection.